I first learned about The Zurich Axioms by Max Gunther in the daily Worden  Report when Don mentioned it among his favorite trading books a few years ago. Soon after, I picked up a copy and found it was indeed packed with some great insights – enough to be a must-have trading book . There are 12 major axioms highlighted in the book, with a chapter devoted to each, as well as 16 minor axioms. It’s a relatively short book at only about 123 pages, but the “Rules of Risk and Reward Used by Generations of Swiss Bankers” offers no shortage of wisdom and insights for any trader or speculator. Without disclosing all of the Axioms, I’ll summarize two of my favorites. Always Play for Meaningful Stakes. This minor axiom highlights the importance of trading with enough size for it to matter. This goes beyond the learning stages in which a developing trader needs to hone his skills and not fixate on the money. Rather, playing for meaningful stakes is about getting over the fear of getting hurt in such a way that when a play works, it’s well worth the risk taken. A story is told in the book about the oil tycoon J. Paul Getty, who grew up rich, but once he became an adult he was sent out on his own. Wanting to enter the oil business, he shunned various opportunities to invest $50 in the early 1900’s in favor of betting nearly his entire savings of $500 on an oil lease he felt was more promising. After paydirt was hit, he sold his holdings for $12,000 just a short time later. Getty mentioned that if he had not struck oil, the $500 would have hurt, but that he could have found a way to save that amount back up again. He was quoted as saying “it seemed to me I had a lot more to win than to lose.” That’s playing for meaningful stakes. As a trader, it’s not about walking a tightrope where bankruptcy is the result if you slip. It means you don’t nickel-and-dime your way throughout the entire year if you want to get somewhere interesting. What an excellent reminder for traders! Gunther makes the point that without some level of optimism, one cannot trade to begin with. However, there is general optimism and there is specific optimism. According to Gunther, it’s the venture-specific optimism which can become dangerous if you allow it. The latter mention of what true confidence is just cannot be ignored here. Do you know how you will handle the worst? If you do, then you’ve got arguably the most difficult element of a trading plan already in place – the adverse exit. The ability to fail gracefully in trading – over and over – is what will ultimately define how long you can stay in the game. Your success may eventually be tremendous, but if you’re unable to handle losing the right way, you’ll be taken out long before the big wins can ever come along. My advice? 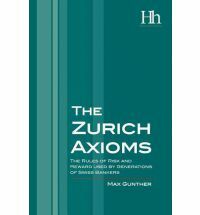 Pick up a copy of The Zurich Axioms and get a pen ready to mark up the margins and underline key points. It’s a quick read and one you’ll return to often.